It’s got a cool parade & haunted fireworks & villains &, oh yeah, candy! What is it? It’s just my favorite party at Magic Kingdom…. 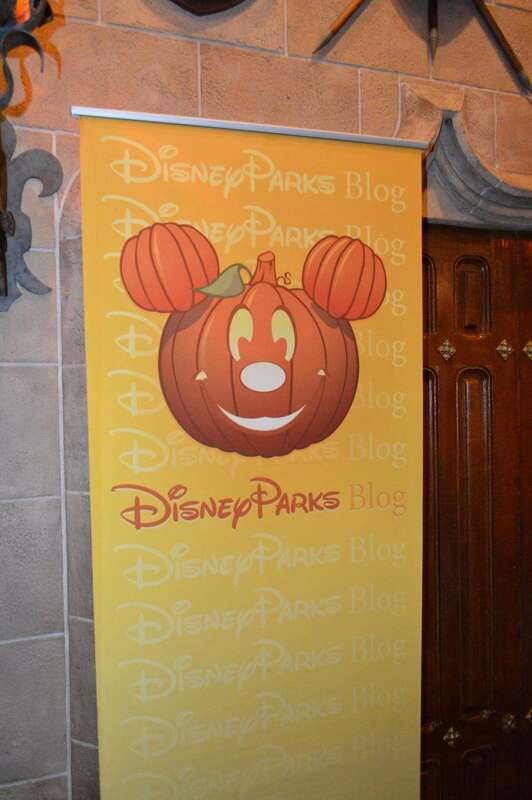 Mickey’s Not-So-Scary Halloween Party! 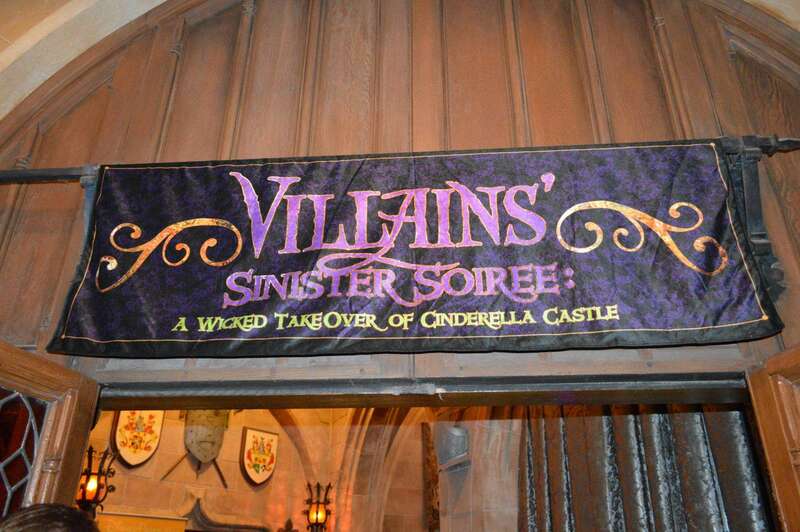 Jason & I recently got to experience this year’s party along with the new Villains’ Soiree. 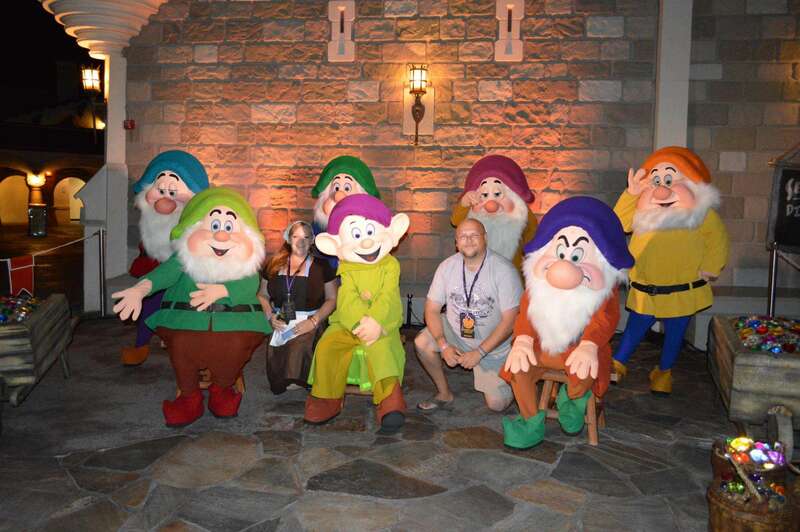 We love the Disney Parks Blog, not because they keep us up to date with all the news we need about WDW, but also because of their amazing meetups! We were invited to attend the Halloween Meetup, which included the party and VIP to the Villain Sinister Soiree! We had so much fun & wanted to share our experience with you! We arrived around 4pm as that is the earliest entry time for party guests. We strolled around Main Street USA & took in an attraction or 2 then decided to grab some supper before the party got into full swing. As we were finishing our meal, we heard the bell toll at 7pm & our ghost host announce that the time had arrived for the party begin! Since several characters wear their costumes to the party also, we decided to meet Mickey to see his costume & snap a pic. The guests ahead of us were from Japan & Mickey spoke a little Japanese to them! We have no idea what he said but they were delighted! Other guests were from Germany & he asked them how to say hello in German (which is hello, if you’re wondering) then Mickey had us all say it together. Such a cool experience! Next, we decided to get the special Sorcerers of the Magic Kingdom card which is only available to party guest. Guests need to show their party ticket & wristband in order to get the card. Then we walked through the Emporium to check out the special event merchandise which is only sold during the party. I really liked the special edition MagicBand as well as many other decor items this year. If you want to get the MagicBand, they start coming out around 6:30PM or so, but you have to show your party ticket to purchase it! Since we were attending the Villains’ Soiree party, we had a special reserved viewing area for the Boo To You parade & Hallowishes fireworks so we headed to check out our spot. This is a nice perk to attending the Soiree especially since we also got free(!) bottles of water! We were able to watch the Villain Mix & Mingle show at Cinderella Castle while we waited. A delightful show with some favorite villains & awesome music. Now, I have to admit, I love a parade & the Boo To You parade is my favorite. 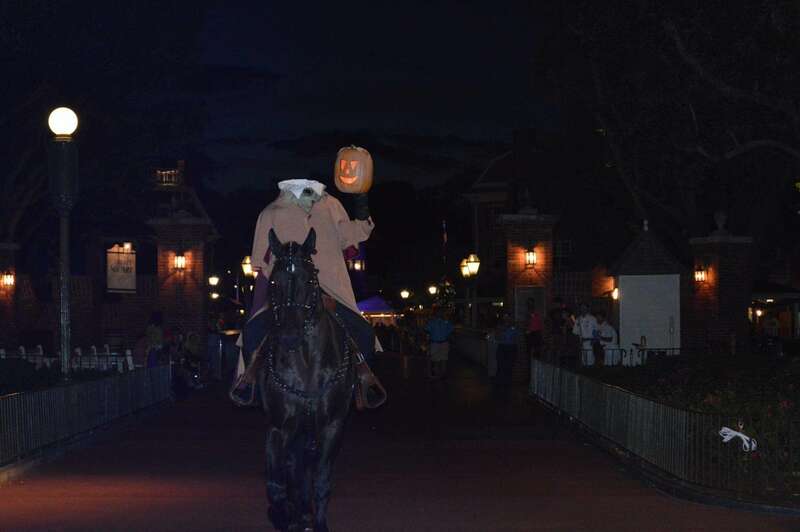 I am always so excited to see the headless horseman trot along the route that I never seem to get a good picture! Luckily, Jason got some great shots. The Haunted Mansion section of the parade is my favorite. It’s lead by the caretaker and a beautiful bloodhound followed by the butlers who literally make sparks fly & then the dancing ghosts. Of course, there are many other characters, dancers, & villains many of whom you will only see in this parade. Be sure to catch it if you go!! Also, the later parade is always less crowded so stay for that one & play during the first one. Since it was only a few minutes until Celebrate the Magic (castle projection show) & Hallowishes, we decided to hang out where we were. I must confess that I hadn’t seen Celebrate the Magic until this time. I didn’t know what I was missing! It’s amazing & magical & wonderful & heartwarming. I was truly astounded at how real the projections looked! Wow! And then it’s Hallowishes time! I love fireworks too & who does them better than Disney?!? Hallowishes is worth watching every single time. It is so fun, creative, & so very well done. Young & old alike will love this firework show. By this time, my night is made but we had only just begun. We had a while until our soiree reservation so we decided to find characters, check out the dance parties, & trick-or-treat. We found: the hag from Snow White behind the Seven Dwarfs Mine Train (near the entrance to Be Our Guest), Gaston at his fountain, Jafar near the Magic Carpets of Aladin, Tarzan & Jane as we entered Adventureland (near the Dole Whips), all 7 Dwarfs by the gates to New Fantasyland, Captain Jack Sparrow near Pirates of the Caribbean, Jack Skellington & Sally near Guest Relations at Town Square, Alice & the Mad Hatter near the teacups (we’re told that the White Rabbit has also been spotted here), and Pooh & friends in their usual spot. And that’s not all because we missed several character spots. Wow! We checked out Club Villain in The Diamond Horseshoe where we found Lady Tremaine & the step-sisters as well as Governor Ratcliff (from Pocahontas). We were told that there are other villains rotating throughout the night. They were having fun dancing & the dj was doing a great job keeping the party going. Next, we ventured over to the Haunted Mansion where we met a resident, a lovely Southern woman named Renatta. She had a particular affection for the gentlemen, especially Master Gracey. She was my favorite character of the night. So entertaining!! Finally, we attended the Villain’s Soiree to end our evening. The Queen of Hearts along with Anastasia & Drizella greeted us in the foyer of Cinderella’s Royal Table. They were certainly having a wonderful time entertaining everyone & were so much fun! We went upstairs for the dessert party which was hosted by Lady Tremaine, the Evil Queen, Dr. Facillier, Maleficent, Cruella De Vil, & Captain Hook. 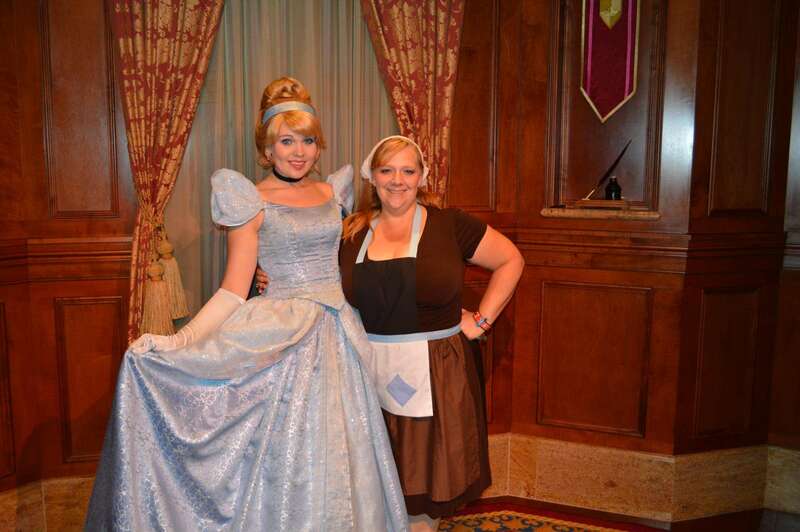 Anastasia & Drizella also joined the party. The drink & each food item was representative of each host. When we were seated, we noticed our personalized menus & the beautiful table already set with Captain’s Not-So-Poisoned Potion. I don’t know what was in it but it was delightful! It was bright green with a foam on top & was sweet yet sour. The table was also set with Lady Tremaine’s Classic Castle Favorites, a meat & cheese tray. Once we had been greeted by Lady Tremaine, she introduced our other hosts for the evening. We were served the plate of desserts at the time. It included The Queen’s Bleeding Heart Apple, Maleficent’s Dragon-toasted Confection, Dr. Facilier’s Chocolate Tarot Card, & Cruella De Vil’s Spotted Chocolate Mousse Cake. They were all delicious, of course. 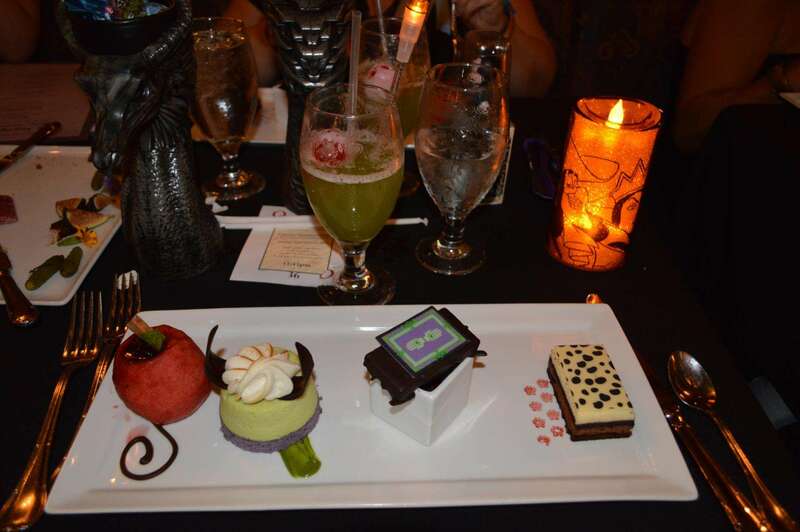 My favorites were Maleficent’s Confection, a pistachio mousse topped with a crisp meringue, & Dr. Facilier’s Tarot Card, a dark chocolate covered pecan praline & flourless chocolate torte. I also like the little paw prints next to Cruella’s dessert…a nice touch. After a couple of songs to which Anastasia & Drizella leant their (ahem) talents & meeting all of our hosts, it was time for the soiree to end. We got to keep the menus along with a Maleficent Dragon cup. The cost of the soiree is $99/person. It took approximately 1 hour of party time. While it is pricey, if you want guaranteed meeting with these villains along with a reserved viewing area for the parade & fireworks then this may be worth it, especially on crowded nights! If you want more information about the parties, click here for dates, ticket prices and how to order! As we walked down Main Street USA to the exit, we were all smiles & romance filled with happiness, the spirit of Halloween, & magic. It was certainly a memorable, magical night during which we got to leave all the cares & stresses of everyday life for just a few hours. Although this is how I usually describe any time I spend at Walt Disney World, it was especially true for this night!